“The State of Homelessness in Canada: 2013 is the first extensive Canadian report card on homelessness. This report examines what we know about homelessness, the historical, social and economic context in which it has emerged, demographic features of the problem, and potential solutions. The State of Homelessness provides a starting point to inform the development of a consistent, evidence-based approach towards ending homelessness. Our goal in developing this report was to both assess the breadth of the problem and to develop a methodology for national measurement. We believe that homelessness is not a given and that not just reducing, but ending, the crisis is achievable. The information for the State of Homelessness in Canada report has been compiled by the Canadian Homelessness Research Network (Homeless Hub) and the Canadian Alliance to End Homelessness from the best available research to date. Because we lack strong data on homelessness in Canada, our estimates of the scale of the problem are just that: an estimate, but they represent an important starting point. As the first national report card on homelessness, the evaluation of the response to homelessness by Canada’s homeless sector provides an important means of benchmarking progress toward ending homelessness. The Canadian Homelessness Research Network, led by York University, created the Canadian Definition of Homelessness as follows. “Homelessness describes the situation of an individual or family without stable, permanent, appropriate housing, or the immediate prospect, means and ability of acquiring it. It is the result of systemic or societal barriers, a lack of affordable and appropriate housing, the individual/household’s financial, mental, cognitive, behavioural or physical challenges, and/or racism and discrimination. Most people do not choose to be homeless, and the experience is generally negative, unpleasant, stressful and distressing. Homelessness describes a range of housing and shelter circumstances, with people being without any shelter at one end, and being insecurely housed at the other. That is, homelessness encompasses a range of physical living situations, organized here in a typology that includes 1) Unsheltered, or absolutely homeless and living on the streets or in places not intended for human habitation; 2) Emergency Sheltered, including those staying in overnight shelters for people who are homeless, as well as shelters for those impacted by family violence; 3) Provisionally Accommodated, referring to those whose accommodation is temporary or lacks security of tenure, and finally, 4) At Risk of Homelessness, referring to people who are not homeless, but whose current economic and/or housing situation is precarious or does not meet public health and safety standards. It should be noted that for many people homelessness is not a static state but rather a fluid experience, where one’s shelter circumstances and options may shift and change quite dramatically and with frequency. Canadian Observatory on Homelessness (2012) Canadian Definition of Homelessness. Here is another definition of Canadian homelessnes. “Homelessness is an extreme form of poverty and social exclusion. Simply put, people who are homeless do not have safe, affordable, appropriate, permanent housing to which they can return whenever they choose. This includes people who are absolutely homeless and are living on the streets or in shelters, the ‘hidden homeless’ who are staying with friends, relatives or in institutional settings, and those ‘at risk’ of homelessness, whose current economic and housing situation is precarious. Homelessness can result from a combination of individual and structural factors. Individual factors that can contribute to homelessness include: deep poverty, mental or physical illness, addiction, trauma, abuse, lack of education and a lack of supportive relationships. Dignity for All, a campaign between Citizens for Public Justice and Canada Without Poverty, reveals that homelessness will end if all levels of government (including First Nations, Métis governments, and Inuit Land Claim Organizations) collaborate to prevent homelessness. This video, from CTV Vancouver Island News, presents “Homelessness Action Week” in Victoria, British Columbia, Canada. “VICTORIA — Canadians are having an increasingly difficult time putting a roof over their heads and making ends meet. Three and a half million in fact are currently living on or below the poverty line. Here in our province it’s even worse. With soaring housing costs and a lack of subsidized housing, roughly fifteen thousand British Columbians don’t have a place to call home. The Our Place Drop In Centre is looking to change that, giving people hand up, not a hand out. For the past three years project connect has brought homeless people and those who can provide assistance together says outreach worker Sarah Wilson. Victoria NDP MP Denis Savoie is pushing for the federal government to pass bill C-304 at the end of the month that will put in place a national housing strategy. Homelessness Action Week is an annual regional campaign across Metro Vancouver aimed at raising awareness about homelessness, and building community capacity and partnerships for local solutions to homelessness. Homelessness Action Week is an opportunity to get involved in homelessness action in your community by attending events, and spreading the word about homelessness action through education, advocacy, and social media activity. The City of Vancouver joins communities and organizations throughout the region to mark Homelessness Action Week. Homelessness Action Week is organized by the Greater Vancouver Regional Steering Committee on Homelessness. The Steering Committee on Homelessness is a coalition of community organizations and all levels of government. “We believe that by working together, we can end homelessness in the Metro Vancouver area. Please click here to download the Regional Homelessness Plan (pdf). The week’s purpose is to raise public awareness on the issues of homelessness, and rally local solutions to the issues. The City of Vancouver is committed to ending street homelessness by 2015, and is a proud supporter and participant in Homelessness Action Week through a number of events and initiatives. 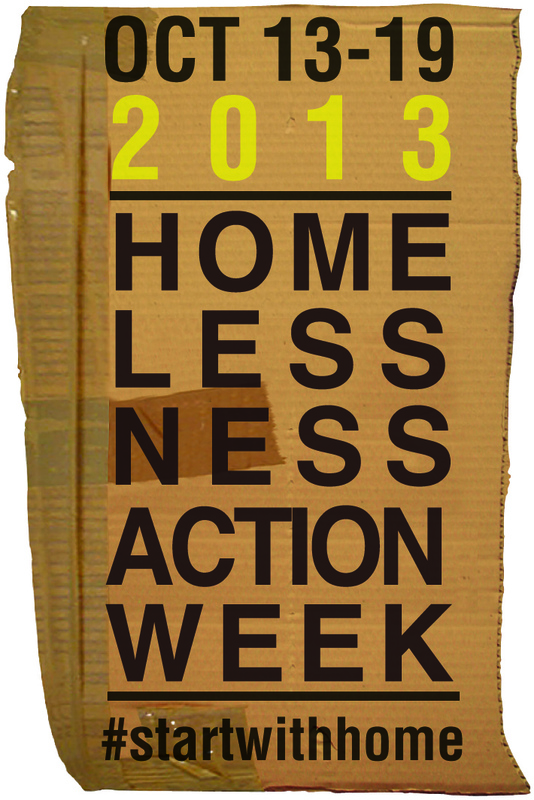 Homelessness Action Week (HAW) includes the following events.